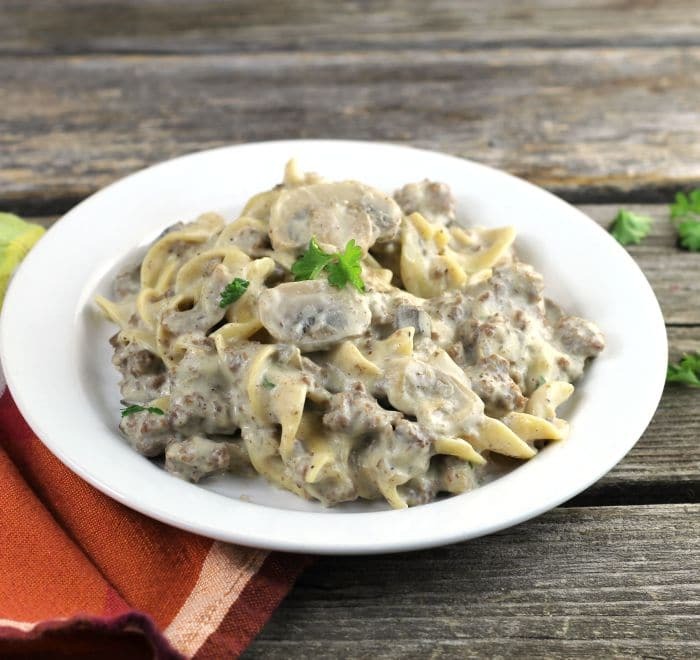 Ground Beef Stroganoff Casserole, a hearty recipe that is super easy to make and takes so little time to make you will have it on the table in less than 30 minutes. 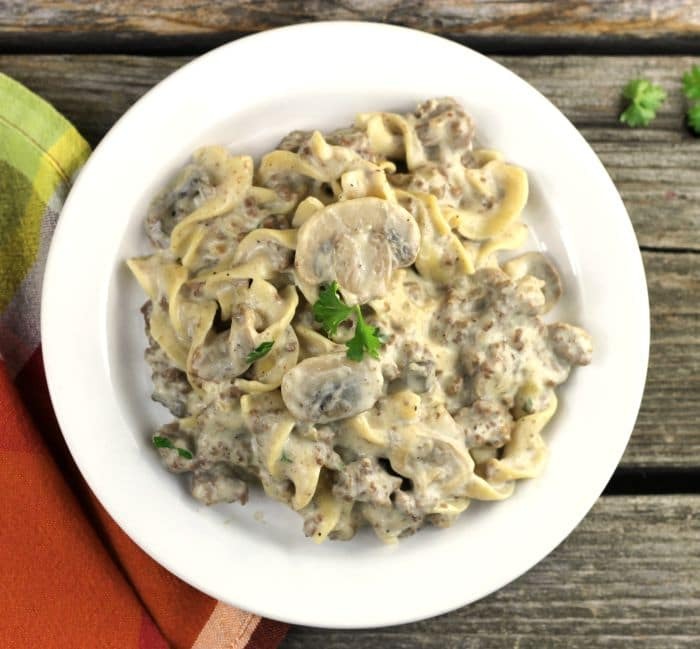 Ground beef stroganoff casserole is full of flavor made with lean ground beef, mushrooms, and cream of chicken and cream of mushroom soup for a delicious meal any day of the week dinner. Growing up in the Midwest means that you eat a lot of casseroles. My mom had some great casserole recipes that she made for our family when I was a kid. This ground beef stroganoff casserole was one that was on the list. I am sure that you will love how quickly this one comes together. Do you have to use fresh mushrooms? I think that fresh mushrooms are always the best (I use white mushrooms in this recipe), but you can use canned mushrooms if you like. If using canned mushrooms make sure to drain the liquid before adding them to the casserole. Can you use more mushrooms than what the recipe calls for? Yes, you sure can add more mushrooms if you prefer. My mom’s recipe did not call for any addition mushrooms beside the cream of mushroom soup. 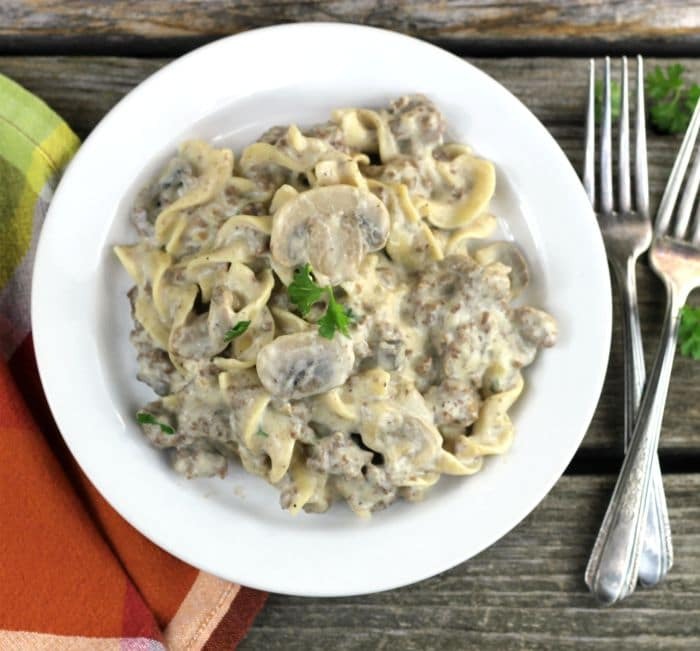 I love mushrooms and have incorporated the mushrooms into this recipe. In a large skillet combine the ground beef, onions, and mushrooms. Cook over medium heat until the ground beef is browned and the onions and mushrooms are tender. While the ground beef is browning cook the noodles according to the directions on the package. Once they are cooked drain and set aside. Season the meat mixture with the garlic salt and pepper. Add the soups and sour cream and stir until well combined. Add the chopped parsley and mix in. Serve. This looks so very flavourful and delicious! Such a nice, quick meal! My mom used to make something similar. Haven’t had this version of Stroganoff in years. Now I’m craving it. 🙂 Thanks! 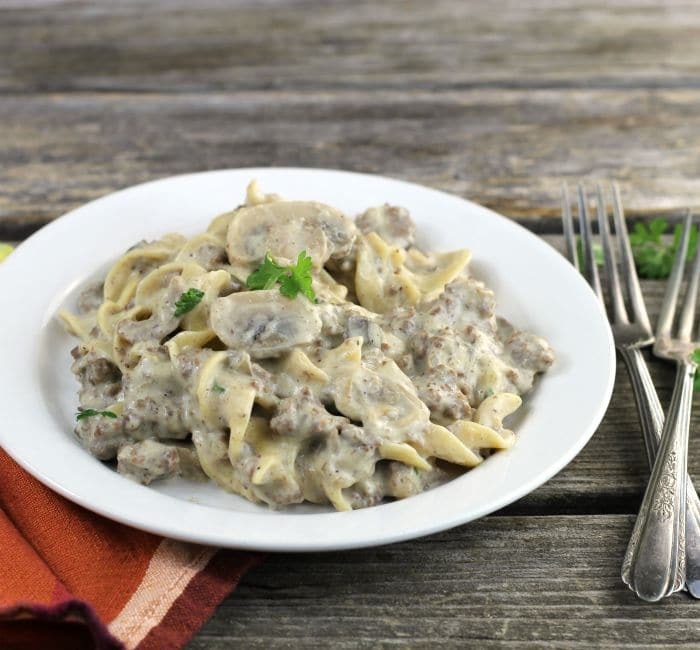 I have a similar recipe for ground beef stroganoff, and it’s one of my favorite comfort food meals! Good tips on the mushrooms here, too! Bill loves stroganoff as much as I do! I love your easy recipe!!! Very interesting! It looks delicious. This looks so creamy and delicious! I love how easy it comes together. I bet my family would love it!